Kanye West was forced to pause an interview after he broke down in tears, while discussing the late fashion professor, Louise Wilson. The 37-year-old was being interviewed by Radio One's Zane Lowe and discussed his 'inspirational' friend, who died in May last year after a battle with breast cancer. The husband of Kim Kardashian attended Wilson's memorial service held at St Paul's Cathedral in London ahead of London Fashion Week on February 20, alongside Victoria Beckham. 'I think she knew she was gonna pass,' he told the host. 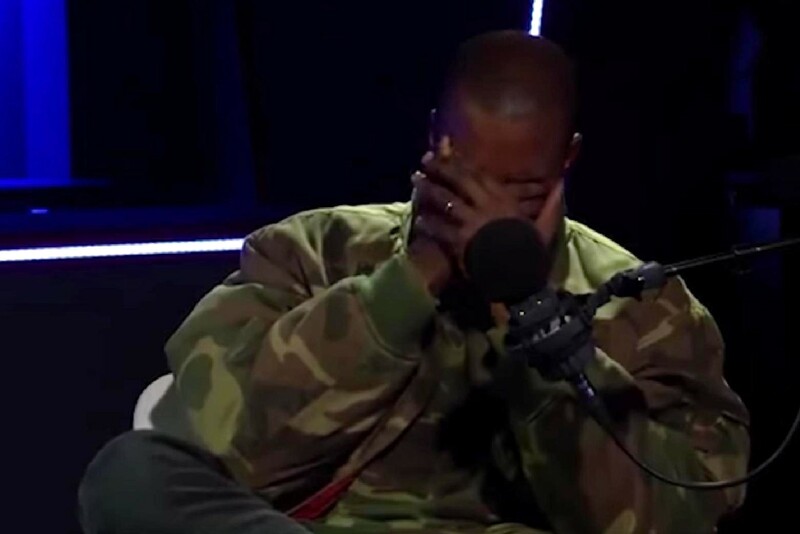 Kanye became very emotional and Zane asked him if he wanted to take a minute as Kanye's sobs became audible. Zane stood up and patted Kanye on the shoulder, before the performer agreed to take a minute and left the room. 'That’s never happened to me in an interview before,' he confessed as he returned. Kanye, who showcased his Adidas collaboration at New York Fashion Week, turned to the 52-year-old Central St Martin's master when he planned to study fashion in the late 2000s. Wilson told Vogue in 2011, 'I have known Kanye for about two years. He is very knowledgeable about fashion and interested - he is also interesting, he has an individual point of view. Professor Wilson was the director of the Central Saint Martins MA fashion degree and had famously trained Alexander McQueen, Christopher Kane and Stella McCartney. Kanye told Zane he was inspired with how Wilson pushed her students, stating that she was 'notorious for not letting people stop at a 7 or 8, but would push for a 12'. 'So many students, they don't give it their all,' he said. Kanye touched upon his own fashion collaboration with Adidas and apologized because the pieces are currently quite expensive.